When Lisa first discovered this frame, we both knew we had to use it, and had the perfect (oddly similar) small oil paintings in mind. Lisa’s was her J.T. 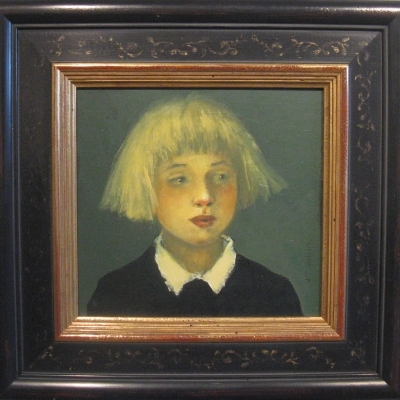 Winik, which had been leaning, unframed, against her mantel for years, while I was anxious to frame my tiny 6" x 6" Elizabeth Bauman (from this years Smalls show). Framing these portraits of solitary women in a beautiful, thick, museum style 4" frame creates a dramatic overall feeling.